Hey guys! Hope you all had a nice 4th of July...doesn't it always throw you off when there's a holiday mid-week? Crazy. It ended up being a really productive week for us--it was like we had an extra Saturday added onto it. And I LOVE getting projects completed. Can I just show you some random pictures of random things around my home? Well that's what I'm gonna do today. So here we go. I picked up a "new" frame at a thrift store a few weeks back for this little print in my kitchen and I'm loving it. The old frame was this cheap-o creamish plastic one and I've wanted something to contrast against the subway tile. This new one reminds me of a barn wood frame--it's a little banged up (character) and it ties in with the other wood in our kitchen (like our counters, barn beam, and something else that you'll see later in this post). I got the picture a while ago for like 50 cents. Seriously, I think that's what I paid. I like having it in the kitchen to remind me of my daily job--nurturing our three boys, like this duck is nurturing her little ducklings. By the way, I love art in the kitchen. Why not decorate your kitchen like you would any other room in your house, right? 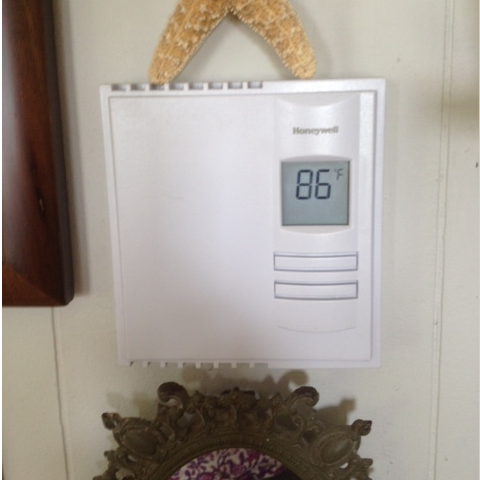 but when it said 86 on the thermostat, I knew it was time to give in. You can only be cheap for so long. There's just something about Triple HK: hazy, hot, and humid and throw a few kids in that mix...not a good situation. I won a silent auction for these cast iron skillets. They came as a pair. The one on the right is a Griswold and the other is unmarked. I honestly didn't think I'd win the highest bid but I guess you never know. Not really sure what I'm going to use the flat one for...but I'm excited to try it out. Can't really see myself making one pancake at a time! The 8" skillet is now my 3rd one. Bring on the skillet cookies, baby! Shoot, I gotta give a shout-out to the go-to meal I made all last week: homemade pizza on the grill. I made up some smaller batches of my homemade bread dough and used it as pizza dough. Have you ever grilled pizza before? It's really fun and quite delish. Just grill the dough for a couple minutes on medium heat (after you brush some olive oil on it) then flip and add all your toppings, close the lid and a couple minutes later you have some bangin' pizza on your hands. Yum. For this batch, I threw some chicken thighs in the crock pot for a few hours, shredded it and added Sweet Baby Ray's to it. I didn't have any mozzarella so I just grated some fresh parm on top and added onions and avocados. My boys scarfed it down. There are a couple of projects that Mitch finished recently that I'm excited to show you. One is this chalkboard in our dining area. I'll have him do a separate post on how he constructed it, but I just wanted to show it to you guys. Ahh...I LOVE it. It's so handy. Right now there's a bunch of lists up there for our upcoming vacation. Ryder felt the need to remind me to bring "clos" (clothes) on vacation. Thanks, buddy, I might have forgotten that one. I'm not a very organized person, so having something like this to write lists on is going to be super helpful in that dept. It already has been. The other thing he constructed is not complete yet (thanks to me). I have to strip, sand and probably stain the top...so we'll see when that gets done. But I'm so stoked to show you it. EEK! It's a baking cart for my kitchen! What have you guys been up to lately? Got any projects you wanna crank out this summer? love the chalkboard....i have a flat cast iron pan and use it to warm tortillas and make quesadillas. That pizza looks delicious! The chalkboard is huge and looks fantastic. I'm jealous! The chalkboard is amazing. We're doing a similar one for a big empty wall in my sons room, so I'll look for Mitch's tutorial post! It was something my carpenter hubby was going to tackle but maybe with a tutorial I could manage it instead! Luved all the little snippets from your post today.. So, I clicked over to get your bread recipe and when you say 1/2 bag of King Arthur can you tell me how many cups approx that would be? I don't think we have that brand at Krogers here in AR--so I just you unbleached organic. Would luv to try your dough recipe this weekend. We are def fans of the skillet cookie!!! I tink I've tried just about every recipe you post! That flat cast iron skillet is for crepes and Swedish pancakes. Seriously, that pan makes all the difference. If you want a recipe, I have one from Sweden (well, a Swedish grandparent). Yay! I knew you guys would know what that skillet was used for;) So awesome--thanks so much! And I would LOVE to have your grandparent's recipe for Swedish pancakes! I'm eager to try out the skillet but to try it out with a new recipe would be even better:) My email address is kathertzler@yahoo.com if you would be so kind to email it to me...thanks so much! Your home always looks so inviting. I could move right in- and I can COOK! I absolutely love your giant chalkboard. What's the use of having one if you can't write a bunch of stuff on it! Plus, I've been giving a lot of thought to scale lately and how one really large item in a room can make or break it. That chalkboard rocks!